Welcome to my tour stop for The Originals: The Rise created by Julie Plec. From the creator of The Originals, the hit spin-off television show of The Vampire Diaries, come three never-before-released prequel stories featuring The Original vampire family. This tour runs January 12th-30th and it will consist of reviews, special content and spotlights. Check out the tour page for the full schedule. Price: $12.95 U.S. / $14.95 CAN. Flawless characterization and a gripping storyline make this a 5 star read! I have a tiny confession... I haven't actually watched The Originals yet. Which is why I was so thrilled to see a trilogy focused on the Originals was hitting shelves this year. I came late to The Vampire Diaries and it's a show I binge-watch on DVD so I'm familiar with the characters just not the show... yet. 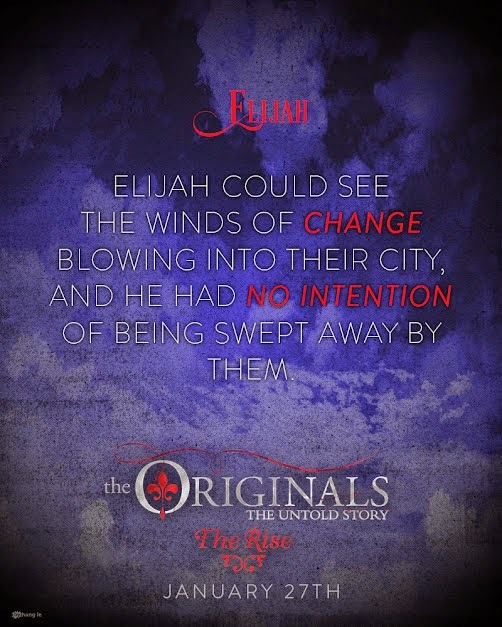 If you're a fan of the characters you will absolutely love THE ORIGINALS: THE RISE, I found myself totally enrapt and hearing the actors who play them narrating as I read. The Mikaelson siblings find themselves on the fringes of a war between the werewolves and witches of 1720's New Orleans. Elijah's plan is to secure a home for them but the witches won't let them have a place so easily. Meanwhile, Rebekah sets about securing the loyalty of the French army only to discover that the handsome captain she has sudden feelings for might be more than meets the eye. A truce between the supernaturals of New Orleans hangs on the marriage of lovely, naive Vivianne but Klaus can never resist a challenge. I'm admittedly much fonder of the Originals than any other characters to come from TVD and Plec does an exceptional job of presenting another chapter in the Mikaelsons' past. I wasn't halfway through the book and I had decided I needed the next one ready to read as soon as it was done. Elijah is so clever and there's a certain softness to him in this story that made me like him more than I had before. This is a younger, less confident version of Rebekah in a way that is quite bittersweet. And, of course, Klaus is as troublesome and charming as ever. TO:TR was very engrossing, I tend to be a slow reader and I tore through it at a pace that's unusual for me because I could not put it down. It's romantic and brutal and witty and flawlessly on point in its characterization—something that I'm always nervous about when reading anything screen-to-book. If you love The Originals you simply must not miss out on this one! I absolutely loved it and the wait for THE ORIGINALS: THE LOSS is going to be frustratingly long. If only all screen-to-book stories were this good. An exclusive Originals cast poster to all who pre-order and complete the form using the above link! Julie Plec is the co-creator & executive producer of The Vampire Diaries & the creator of The Vampire Diaries spin-off, The Originals. Plec got her start as a writer and producer on the ABC Family series Kyle XY. She also collaborated on the CW drama The Tomorrow People. Her screenplay adaptation The Tiger’s Curse is in development at Paramount, and she will produce the feature @emma with Darko Entertainment. Past feature production credits include Scream 2 and Scream 3. 15 prize packs including: A copy of The Originals: The Rise and a copy of The Originals season 1 on DVD. I'm so glad you really connected with this one! Thank you so much for hosting a tour stop and sharing your thoughts!